October is Breast Cancer Awareness Month so I'm sharing five products that are raising awareness for breast cancer. I'm a huge fan of these brands, and I'm happy to see them offering products that benefit this cause. I'm also making a donation to the Susan G. Komen foundation this month as part of #58 on my 101 in 1001 list. 1. Pick up this limited edition Bobbi Brown French Pink Set of blush and blender brush and Bobbi Brown will donate $10 to the Breast Cancer Research Foundation. They are also offering free standard shipping on this item during the month of October. 2. LOFT has partnered with Giuliana Rancic to create an exclusive jewelry collection by Suzanna Dai (Giuliana's favorite jewelry designer). During the month of October LOFT will donate 60% of the purchase price of this necklace to the Breast Cancer Research Foundation. 3. Tory Burch partnered with the Breast Cancer Research Foundation to create this cute mini umbrella with the signature Tory Burch logo. 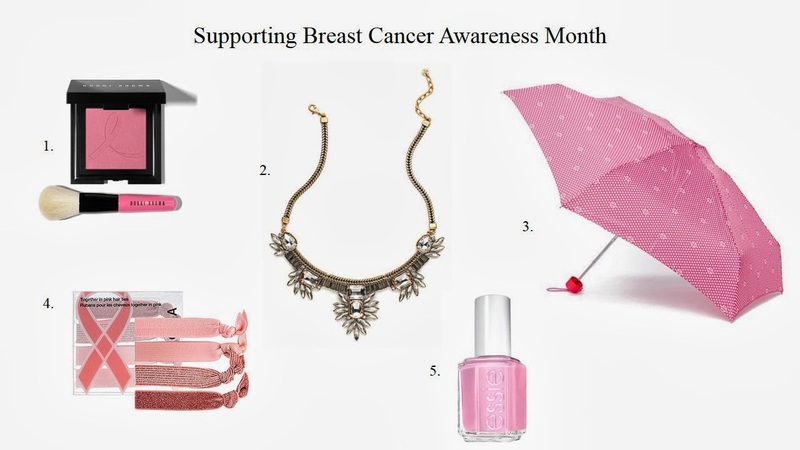 Tory Burch is donating 20% from the purchase of the umbrella to the Breast Cancer Research Foundation. 4. I can't get enough of these functional hair ties from Sephora. To show support for Breast Cancer Awareness they created a stylish limited edition pink collection. 5. Essie has created a Breast Cancer Awareness collection that features pink nail polish hues to raise awareness for Breast Cancer. That Loft necklace is so beautiful! Lovely picks for a great cause.